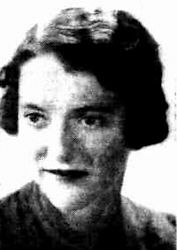 On 27 October 1934, Eva, aged 25, married Ernest Edmund Kerntke, aged 37, son of Heinrich Ferdinand Kerntke and Antonie Emilie Ida Ebert, in Methodist Church in Clare, South Australia . In the Clare Methodist Church on Saturday October 27, Ernest E. Kerntke, son of the late Mr. Kerntke and Mrs. Schierve, of Adelaide and Eva Laurel, second daughter of Mr. and Mrs.G. Stancliffe, were married by the Rev. R. A. Pederick. The church had been decorated with flowers in mauve and fuchsia colorings to tone with the bridesmaids frocks, by Miss E Waller and girl friends of the bride. As the strains of the "Bridal March" were played by Mr. B. Ellery, the bride entered the church with her father. She wore a gown of crepe mattalasse designed on princess lines and merging into a train. Touches of silver lame were used as trimmings. The embroidered silk tulle veil was arranged cap fashion and held in place with a kilted tulle band. A sheaf of pink, white, and mauve flowers was carried. The bridesmaids, Misses Ina and Elsie Stancliffe (sisters of the bride) wore frocks of windswept satin and silver lame finishings in fuchsia shades. Headdresses of tulle to tone arranged in halo style were accessories to the frocks. Posies of flowers were carried. Mr. Harry Kerntke was best man, and Mr. Leslie Leaver groomsman. The church choir sang "O Perfect Love" and "The Voice That Breathed O'er Eden" during the ceremony. Mr. B. Ellen played the organ. While the register was being signed, Miss Janet Scott sang "Thanks be to God." As the bridal party left the church, Molly Giles hung a horseshoe on the bride's arm. A reception was held at the Methodist lecture hall, when sixty guests were received by the bridal party. Mrs. Stancliffe wore a black and white frock with hat to match and carried a posy of red roses. Mrs. Shrieve chose a black toilette relieved with touches of white, and had a posy of pink flowers. The table decorations were in pink, mauve and white flowers. The Rev. R. A. Pederick presided over the gathering.